We were big fans of the previous generation Cadillac CTS-V, so we were obviously anxious to check out its predecessor, launched for 2016. 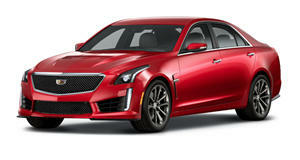 To be clear, this all-new third generation CTS-V is even better, and Cadillac didn’t hold anything back. Power comes from the same supercharged 6.2-liter LT4 V8 that powers the Corvette Z06. The CTS-V produces a total of 640 hp and 630 lb-ft of torque, with power going to the rear wheels through an eight-speed automatic. No manual is offered and, honestly, we didn’t miss it. Going from a standstill to 60 mph in 3.7 seconds and a claimed 200 mph top speed more than makes up for the fact you can’t row your own gears. Our 2017 Cadillac CTS-V tester came fully-loaded, including a $500 Chrystal White Tricoat exterior paint job, $595 Brembo brake calipers, a $1,450 Ultraview Sunroof, and the $6,950 Carbon Black Package. Don’t worry, there are even more extras, all of which are discussed in our latest unboxing review. So, the question now is whether or not the CTS-V is a BMW M5 and Porsche Panamera Turbo S killer? Well, the current M5 will soon be replaced and the Panamera lineup is all new, so let’s just say the full-size, high-performance luxury sedan battle has never been fiercer. And that's just how we like it.